In most forms of Double Inlet Left Ventricle, the positions of the great arteries (pulmonary artery and aorta) and the left and right ventricles are the reverse of the normal heart. The right ventricle is frequently small and both the mitral and tricuspid valve open into the enlarged left ventricle, which is on the right-hand side of the body. 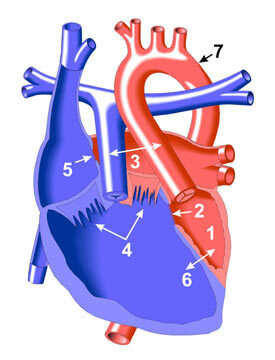 In addition, there are defects (openings) in both the atrial and ventricular septa (ASD and VSD). Double Inlet Left Ventricle is one of the so-called Single Ventricle heart defects, as there is effectively only one pumping chamber in the heart.